What a surprise! 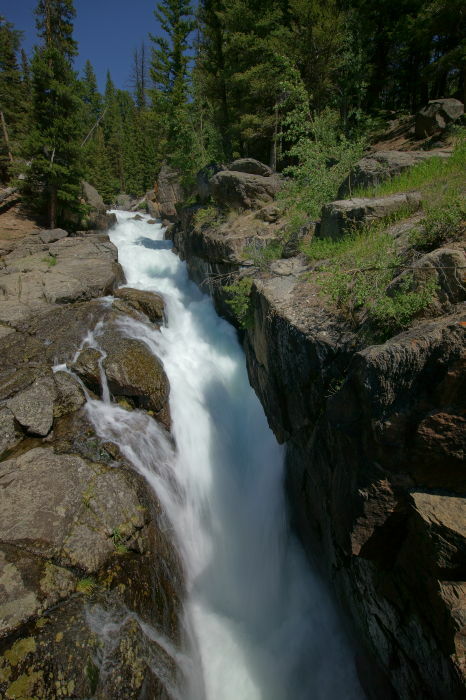 There’s a great waterfall that’s very easy to access, right alongside the Beartooth Highway. But, it’s very easy to miss, and there are no signs posted to help you find it. Lake Creek Falls is worth a brief stop, if you see it. Lake Creek Falls is located on the north side of the Beartooth Highway. 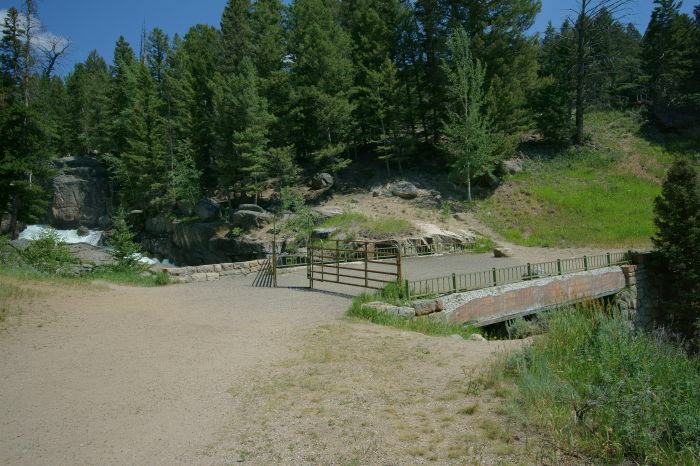 If you’re headed eastbound, watch for the waterfall on the left side of the road as you cross a bridge, shortly after you pass the turnoff for Chief Joseph Highway, and just after the dirt road to Lily Lake Campground. There is room to park at the side of the road on both ends of the bridge. I had no idea that Lake Creek Falls existed, but I just happened to catch a glimpse of it as I was headed down the Beartooth Highway, towards Chief Joseph Highway. There it was, at the side of the road, behind a crumbling old bridge. I had just enough time to pull over and check it out. That old bridge isn’t much to look at, but it played an important role in the Beartooth Highway’s history. The concrete bridge was likely built in 1932 and was bypassed when the new bridge was built in 1974, according to bridgehunter.com. 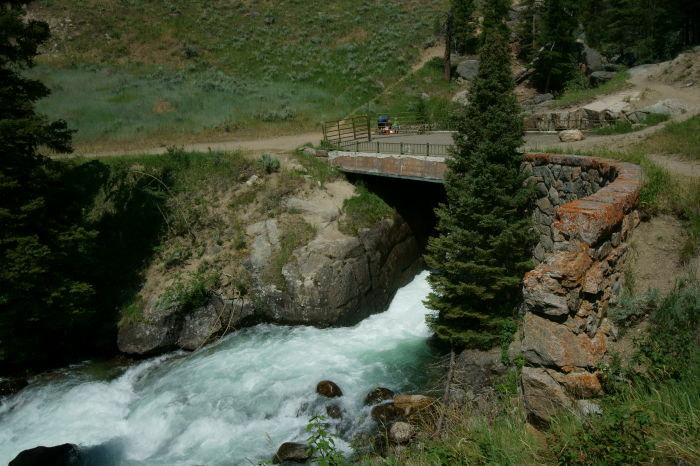 It’s one of five original bridges that still exist along the Beartooth Highway. Now, it’s hard to imagine that tight curve that would have been necessary for the old road to cross this bridge. There is a gate on the west end of the bridge, but it was unlocked and open, so I had no trouble getting through. Lake Creek tumbles through a narrow slot in the surrounding rock. On this sunny day, it was tough to get a very good picture of it. On the other side of the bridge, you can still see the stone wall on the approach to the bridge. There are some trails that run alongside Lake Creek, so you could do some more exploring. I wanted more time to spend on the Chief Joseph Byway, so I didn’t spend a lot of time here. 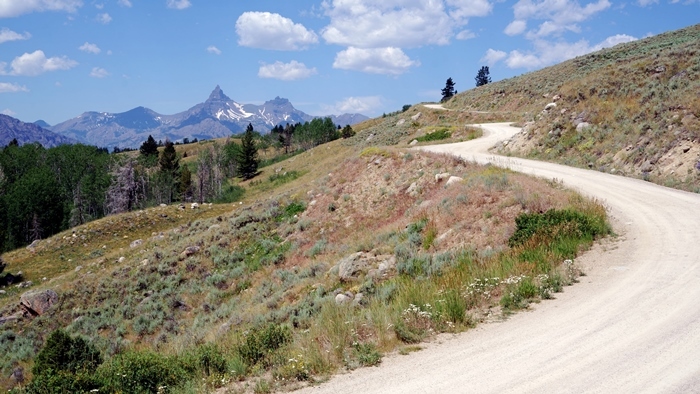 There’s one more spot you might want to check out, before turning down the Chief Joseph Byway or continuing on the Beartooth Highway. Watch for a dirt road that leads to Lily Lake. You could drive all the way out to the lake (I did, and it wasn’t spectacular), but I think the road itself is the main attraction. You should be able to take some nice photos with the dirt road leading towards Pilot and Index Peaks. It’s just a quick stop, but you’ll want to watch for Lake Creek Falls and the historic Beartooth Highway bridge, alongside the modern-day road.